Nice! Just need the medical student accidentally yanking out vital pieces of equipment whilst trying to do an examination and it'll be authentic! 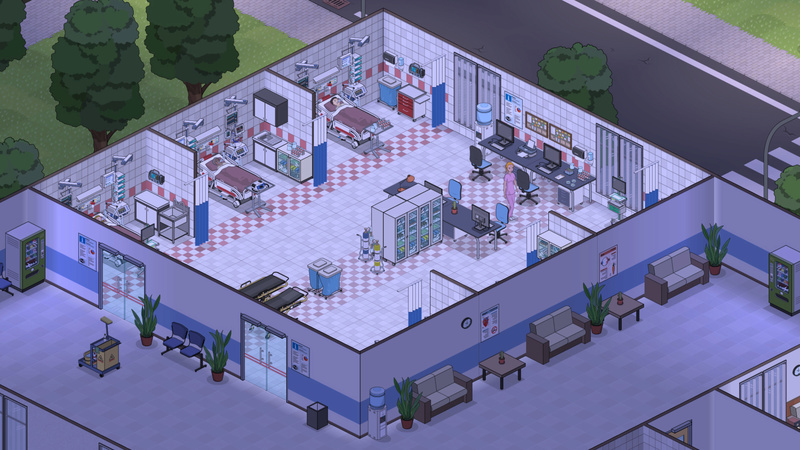 Will I be able to build seperate rooms for the ICU beds like in the ward where I have like one or two ICU beds per room? In our hospitals (The german Intensive Care Units) there are also a maximum of 3 beds per room. That's why I would also like to split up into several rooms. But I think as a result of that we can determine the function of the spaces freely that should not be a problem. But it can also be that I'm wrong!? I was wondering because the ICU of the hospital in my town has rooms for one or two beds and the University Hospital of Lübeck will build ICU rooms for one or two beds in their new building. Good morning, good day or good night! ProfessorTalyban wrote: Will I be able to build seperate rooms for the ICU beds like in the ward where I have like one or two ICU beds per room? Hi, yes, the layout of the rooms and number of beds is completely up to you, as long as you place all the necessary equipment. We also plan to give a mood bonus to patients who have a room of their own, compared to patients in a crowded space. The mood bonus for the "private sphere" would be the logical consequence! Keep it up! Issue with Chinese Elm, one day leaves on the tree, next day they fell off!